1. Achieving something memorable means struggling day after day to make a dream an achievement. I had always dreamed about crossing an ocean on a racing yacht and it looked like an adventure, as the boats sailed towards the sunset. 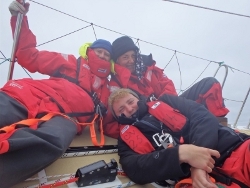 The reality is not pretty – you have to drag yourself out of bed after a few hours of sleep, get soaking wet in the freezing cold, the skipper is screaming at you most of the time and you are not even sure what’s expected of you. But you learn, and you rely on your team to show you the ropes and support each other. And it’s what gets you through the tough times, when the leader acts like a raving lunatic (this also happens at work as stress attacks!) and all you want to do is sleep. 2. It gets scary, which makes you feel alive. Getting out of your comfort zone seems crazy – but it’s what reminds you of how strong you really are, and that you can do things that are scary. And by doing scary, new things, you discover yourself and the power you have to live life. 3. You can complain about life, or you can enjoy the challenge. People that complain can bring everyone down and the ones that find the joy in the worst of times, are the ones that you will stay friends with for a long time. Choose your friends carefully to get you through the tough times. I will remember the smiles of my friends who lifted me up in the tough times for years to come. 4. When it’s over, you only remember how amazing you feel from achieving something memorable. Just like studying for exams, it’s hard being on a boat, and having to push yourself day after day, and dealing with the fear that you don’t know enough to get you through. But when it’s over, all you feel is a sense of achievement that no-one can take from you. You know that you have what it takes to achieve beyond what you imagine now. Each time you push yourself out of your comfort zone – be it sailing in the pitch dark in the middle of the ocean, or getting to grips with a subject that seems like Greek to you, you build your self-confidence and you develop your skills as a leader – of your own destiny. It’s in the daring to begin that matters, not whether you succeed or not – too many people don’t even try in case they fail – but if you don’t try, how will you know what you are capable of. So, start living, try something new and scary and discover who you really are. Sue is the CEO of Argo – a multimedia communications company focused on creating an impact in the South African education sector. Last year she was part of the Invest Africa team that sailed from the leg from Rio de Janeiro to Cape Town in the Clipper Race.